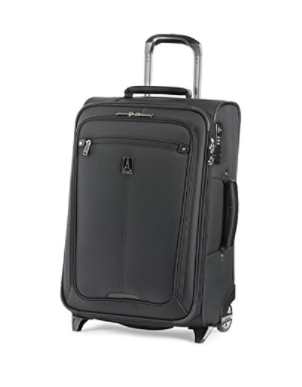 Black Travelpro Marquis 2 is a rollaboard luggage set of three suitcases with the sizes of 21, 22 and 25 inches. You can purchase them individually or as a set which works out to be roughly 50 dollars cheaper on the day of this review. Marquis suitcases have an innovative design and are lightweight as a very good quality nylon fabric coated with repellant Duraguard is used on all of them. They have the built-in TSA compliant locks for the main compartment so only the TSA staff at the airport can unlock and check the contents of your luggage without needing to break the lock. The TravelPro Marquis suitcases have the special patented MagnaTrac system- wheels that ensure rolling in a very straight line. They are spinning type ball-bearing in-line skate wheels that rotate 360 degrees in multiple directions and they have the contour grips with TPR touch points. The wheels also include solid wheel housing and skid bar so they are protected against abrasions. Even though the 21, 22 and 25 inch bags are not particularly big if you have a lot of stuff for a long trip, they are spacious inside and you can expand them by up to two inches with the tapered expansion capability. The zipper is about three quarters of around the suitcases so when you unzip it will expand at the bottom making a wedge shape. But if you expand the 21 and 22-inch carry-on bags you may not be able to fit them in the overhead space on some planes. The 25-inch bag would be too big as a carry-on and needs to be checked in at the airport. They have the full-length front pockets with the integrated ticket pockets for the last-minute items or those you want easy and quick access, at the airport terminal. The telescoping extension handle is the patented PowerScope type that feels very solid, minimises the wobbling and stops and locks at two points. You will also enjoy the three cushioned handles on the top, bottom and the side. Please note that the code for the TSA-compliant lock would be set to 000, in case you get your bag locked with the zippers snapped into the lock and you will find the instructions to set a new code inside the bag. These are lightweight, functional and very well made- sturdy and durable, great quality bags that will survive the tough handling of airport staff and that roll easily on different surfaces. 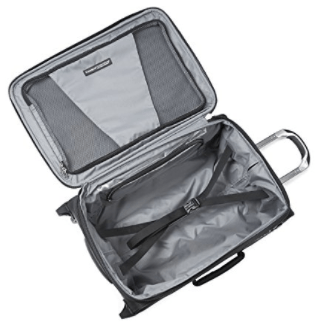 TravelPro is a very well known brand in the luggage industry for build quality, durability, and design innovation and has been in business for almost three decades. The first and original rollaboard bag with two wheels and an extendable handle was also created by the Northwest Airlines pilot Bob Plath, the founder of TravelPro.